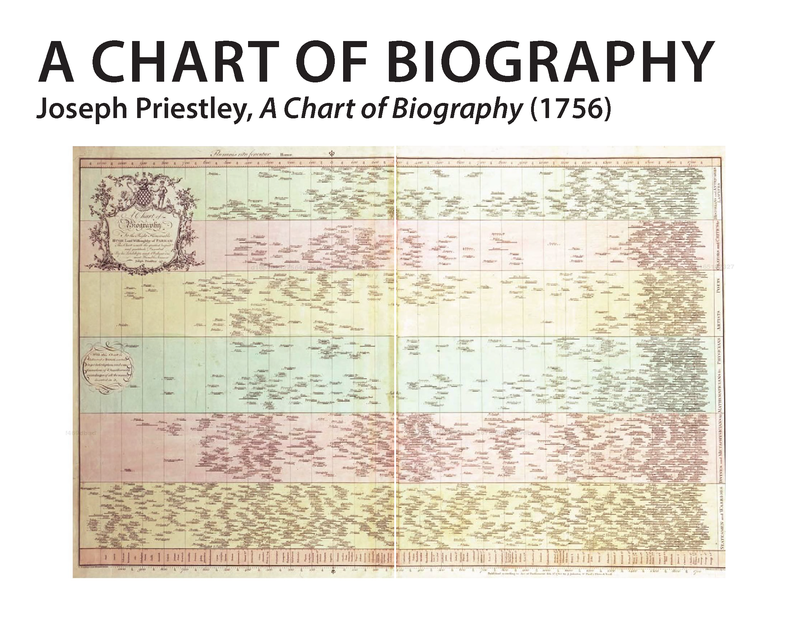 “He who postpones the hour of living as he ought, is like the rustic who waits for the river to pass along (before he crosses); but it glides on and will glide forever.” —Horace, Epistles (I.2.41), quoted in Priestley, Description of a Chart of Biography, 24:476. Few examples of critical work classified as time maps are discussed in the numerous publications of history and cartography. Rosenberg and Grafton suggest the ubiquitous nature of lines and history education is not without merit; it is easily understandable. Historically, this has not always been the case. Chronologies are often dismissed as rudimentary by historians. For most, to qualify as historiography the considered must deal in real events, and it is not enough to represent events in chronological framework that they originally occurred, the events must revealed to possess a structure. Why is the timeline an apt visual analogy? Numbers are organized and defined by the line. Our whole perception of temporality is based on linear sequencing. While our modern understanding of timelines (with one axis and regular distribution of dates) is only 250 years old, the analogy has been evolving since written culture’s beginning. Technical innovations in printing and plotting at the end of the 17th century permitted the visual analogy of the timeline to met with precision under the lens of the scientific eye. Innovators in the late 17th century and early 18th century began to tackle how to represent how create more complex visual schemes to aid in the presentation of the most complex ideas. However, the scholars began to develop ways to simplify and create a visual scheme that clearly communicated the uniformity, directionality and irreversibility of time. English scientist and theologian, usually associated with the first instance of chemical isolation of oxygen, and the invention of soda water. His belief in the study of history celebrates world’s successes as well as a tool for the future generations to anticipate practical needs. The study of history is a narration of God’s natural laws, and by understanding how His higher power has previously worked brings human enlightenment closer to a comprehension of God Himself. time malleable and expands/contracts depending on rhythms of generations and importance/documentation of events. represented the birth and death of historical figures, despite merit, categorized by accomplishment spectra. date/time measures on top and bottom showing horizontal lines as spans of time famous historical figures had lived. few “new” techniques or ideas, yet it was the most strikingly simple diagram produced to this date. the timeline was “a most excellent mechanical help to the knowledge of history” and now an image of history itself. History, at that time and in Priestley’s opinion, moves forwards and backwards to make comparisons and contrasts, and allows for branches to follow plots and subplots. Chart of History: accurately register the lives and deaths of two thousand famous men on a scale of three thousand years in “universal time”; the fates of seventy-eight principal kingdoms during the same period. The two charts were available as posters to be framed or as scrolls wound up on rollers. Designed for the curiosity and pleasure of a general reader, they were also meant to serve the scholar. Chart of Biography: Short or long ellipsis (…) to show uncertainty of birth or death at end/beginning of line. More ellipsis, more time of uncertainty. 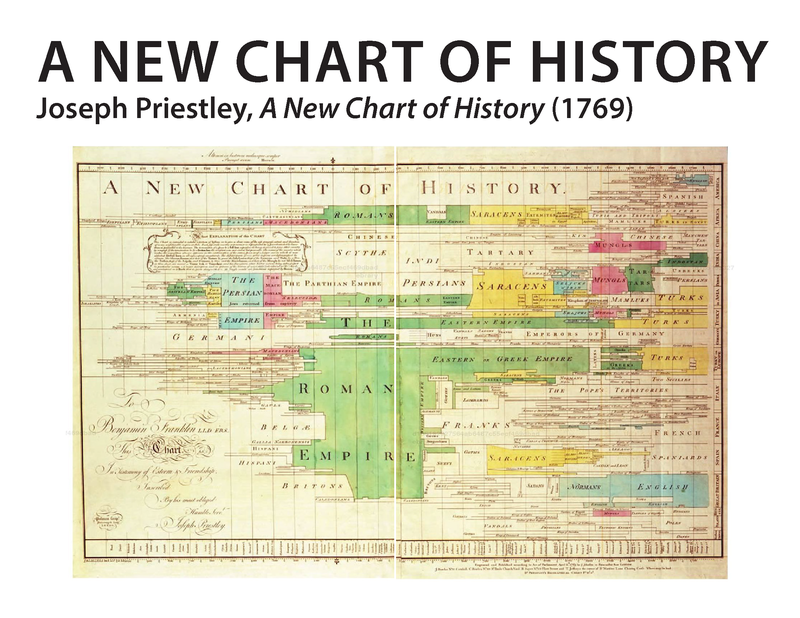 For Priestley, the essence of the chart was to give a broad view. the way the lines bunch up on the right side shows the rapid acceleration of progress. 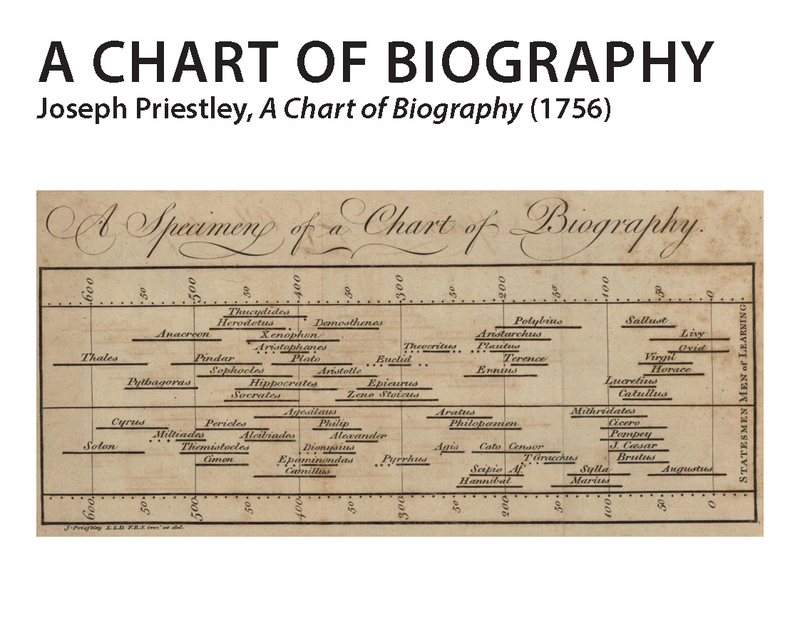 From a distance, to use his own analogy, the lines on the Chart of Biography should look like “so many small straws swimming on the surface of [an] immense river.” In some eras, these flow smoothly from left to right as in even water. In others, they bunch up or separate as the currents of history change speed. The chart is densest with biographical lines at the farthest right edge, that is to say, in the most recent historical period. This is no accident of historical record. In other words, in Priestley’s view, the mass of straws accumulating at the right of the chart represents an actual historical phenomenon, the “acceleration” of the arts and sciences in his own time. And, indeed, on his chart, something called science literally takes on a figure, perhaps for the first time. the whole of history is before you, a medium that is possible less partial than the actual experience. here the graphic analogy of the line points to human violence and turmoil, blood shed. he believed that history had a direction. the mechanism that he developed for representing chronologies in graphic form achieved its popularity in part because it lent itself so well to the figuration of progress. 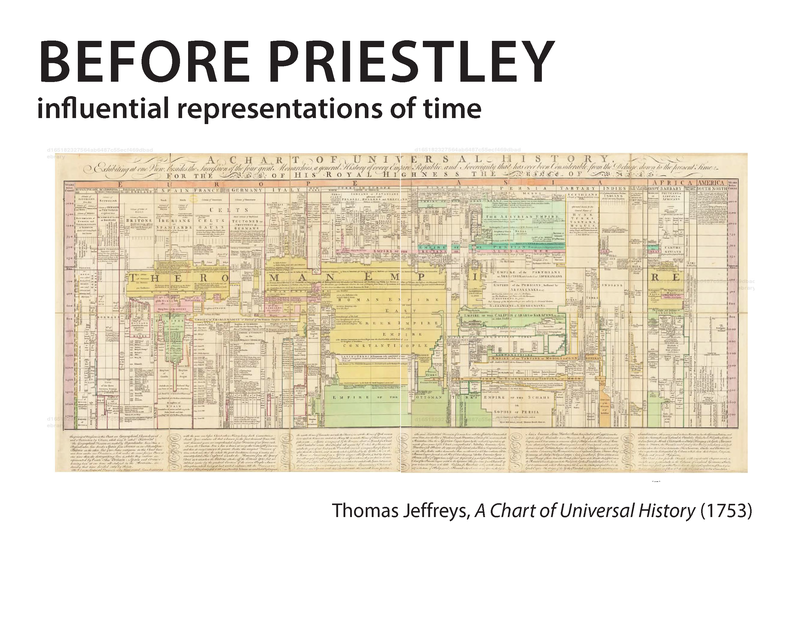 But for Priestley, the timeline was something else: it was a mechanism for breaking open historical narrative and for subjecting it to questions that it resisted in form. If the Chart of Biography in some way looked like progress, this was not true for the Chart of History, nor would it be for a hundred other charts plotted within the same epistemological space. 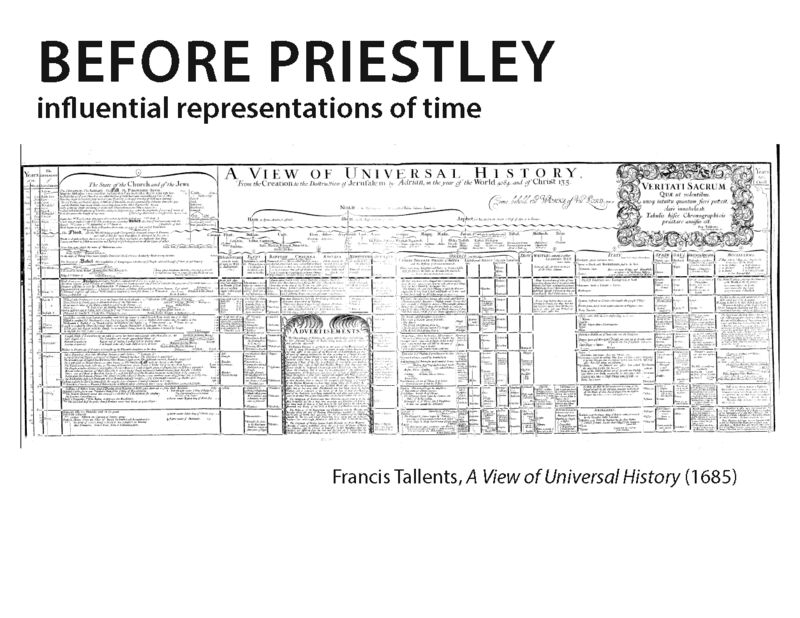 For Priestley the creation of the timeline was a step toward reckoning with the many ways of seeing and representing history. Harry’s Holiday: plot hinges on a young boy’s attempt to hand copy one of Priestley’s charts—a foolish effort which occasions a lecture from his father on the virtues of mechanical reproduction. Many reproductions of his charts, and expansions on such, are seen littered throughout 1800s academic work.